The Brewers announced Tuesday morning that Scooter Gennett has been placed on the 15-day Disabled List (retroactive to Monday, April 20) due to the left hand laceration he suffered during a post-game shower in Pittsburgh on Sunday. 2B Scooter Gennetthas been placed on the 15-day disabled list with a left hand laceration, retroactive to 4/20. To clear a spot on the 40-man, RHP Brandon Kintzler was designated for assignment. Kintzler was just activated off of Colorado Springs’ disabled list Tuesday morning after a reported fingernail avulsion. RHP Brandon Kintzler has been reinstated from the DL in Colorado Springs. We roll along on “Brewers By the (Jersey) Numbers” as the temperatures dip in Wisconsin. Hopefully knowing that we’re one day closer to Opening Day on April 6 helps warm your soul. Brandon Lee Kintzler is no stranger to the BBtJN countdown series. As such, if you really want his full backstory of overcoming injury, persevering through non-affiliated ball, working his way to the big leagues, and overcoming more injuries to stick…hit the search box and enter “Brandon Kintzler BBtJN” and scroll through the previous accounts. After you do that, however, realize that 2014 contains another chapter in his saga. After once working his way into a prominent setup role in Ron Roenicke’s 2013 bullpen, Kintlzer dealt at times with ineffectiveness due to, perhaps worse, some inconsistency last season. The inconsistency was brought on by physical limitation as Kintzler wound up requiring off-season surgery on his left patellar tendon to correct an issue which had progressively gotten worse over the course of two years. The 5’10” right-hander from Nevada is no stranger to overcoming odds though, as I mentioned. He was still able to figure out a way to pitch relatively effectively, including being a secret weapon (as much as any statistic can be a secret these days) against opposing left-handed hitters, who he collectively held to a .648 OPS in 88 plate appearances. .250/.310/.338 slash line. Believe it or not, that’s actually worse than he career split against lefties. Speaking of career splits, Kintlzer was markedly worse against right-handers in 2014 when compared to his full MLB career. Kintzler looks to return to a middle relief role to begin 2015, though he could pitch his way back into the later innings if his knee proves to be as troublesome in 2014 as he felt it was. 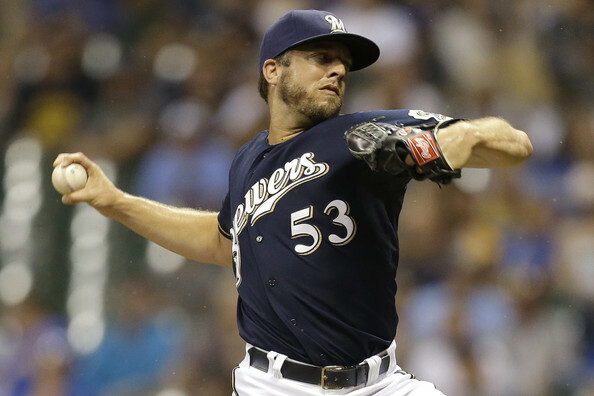 Higher-leverage situations will be harder to come by for Kintzler should the Brewers do what many people expect and add another piece to their bullpen before camp breaks. We haven’t been given an official update on Kintzler in some time, but the fact that it wasn’t a point of discussion at Brewers On Deck back on January 25 in Milwaukee makes me think that he should be a full participant in camp from the first day on. Then again, they could very well ease him back if they want to monitor the knee to see how it reacts to more consistent pitching. All that said, I expect Kintzler to rebound and once again contribute to a bullpen that could be a strength for this edition of the Brewers. In the sequel to the pre-All-Star break roster shuffle, the Milwaukee Brewers today announced that they have made a move in an attempt to bolster the big league bullpen. The move required both a 25-man roster spot as well as a 40-man roster spot. To facilitate those moves, RHP Rob Wooten was optioned to Triple-A Nashville (25-man) and rehabbing right-hander Jim Henderson was placed on the 60-day disabled list (40-man). All this was done so that the Brewers could select the contract of RHP Jeremy Jeffress. Jeffress was made headlines more than once in Milwaukee. He was a part of the package of prospects sent to the Kansas City Royals in exchange for Zack Greinke. 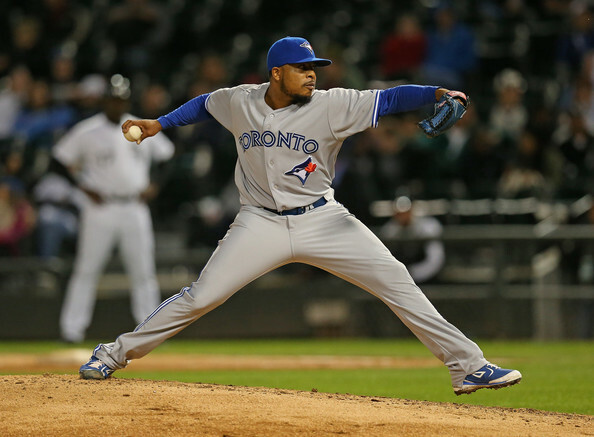 Earlier this season, he chose to re-sign with the Brewers organization after being designated for assignment by the Toronto Blue Jays and electing free agency after clearing waivers. He also was almost out of baseball completely during his first turn in Milwaukee’s system as he was suspended more than once for marijuana use. By multiple accounts, he’s clear of that recreational drug use though, but is now back on a 40-man roster anyway. Much more importantly than his off-the-field history is his on-the-field production so far in 2014. In other words, there’s a much better reason that he was added to the 40-man roster this time around. That’s good for a 9.7 K/9 and a 2.50 K/BB, but it’s also worth noting that he’s been even better recently. Jeffress hasn’t given up a run since June 23rd, a span of nine appearances. He’s only given up two runs in his last 15 games and just three total in his last 24 trips to the mound. Jeffress has always brought the gas on his fastball, but it will be his ability to command his breaking ball that will translate to big league success. He’s shown the other sought-after ability to miss bats at multiple levels as well, something which would serve him and his new team very well moving forward for the balance of 2014. As for the others involved, Wooten hasn’t been bad and will likely be back up in September if not sooner. In fact, by effectiveness, Brandon Kintzler may have been a better candidate to go down, but Wooten’s option year is already burned and that likely played a part in the decision. For Jim Henderson, this must be seen as a referendum on where he’s at physically. Recent reports show him lagging behind the needed 97 MPH on his fastball. I haven’t seen any recent accounts of his slider command nor how his “work-in-progress” change up have fared since he got back on the mound, but without the heat I’m not sure the other pitches matter a lot. The timing doesn’t make much difference on his being moved to the 60-day DL though (he’s already spent more than 60 days on the DL having been placed on it on May 2nd), so maybe everything is progressing fine, but you normally wouldn’t make the move with a guy set to return any time soon. Here’s the latest from Milwaukee, St. Louis, and Brevard County. Braun Having Relationship Issues With Rib Cage, Intercostal Discourse At Fault? After he laid down a bunt base hit late in Saturday’s 5-1 victory over the Chicago Cubs at Miller Park, Ryan Braun was caught by television cameras explaining the action to first base coach Garth Iorg. And while I don’t think he exactly said, “I only did that because my oblique is [feeling a bit off of normal],” the fact remains that Braun has a slight strain of his intercostal. It’s an ailment that’s plagued him in the past, including in both 2011 and 2012. Braun was originally diagnosed as “day-to-day”. 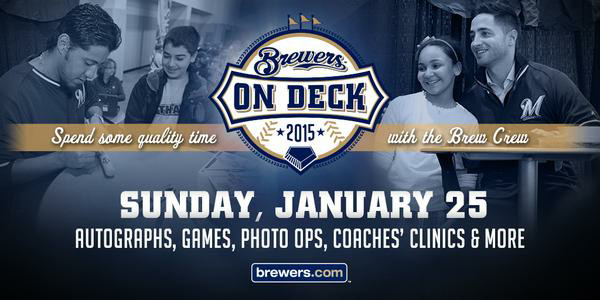 However, after Sunday’s game, manager Ron Roenicke reclassified him as likely to miss the next “three-to-five days”. Those are keys divisional road series in St. Louis (Monday thru Wednesday) and Cincinnati (Thursday thru Sunday). 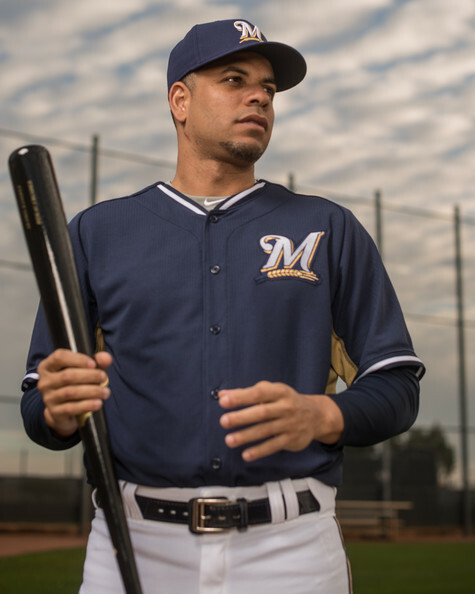 The Brewers will miss his bat against the Cardinals. As such, Roenicke was non-committal about starting Elian Herrera in right field for all the games Braun misses, however many that turns out to be. When prompted with Mark Reynolds’ name, Roenicke recounted how Reynolds did play a game in right field for the Brewers during Cactus League play this year. *** UPDATE – 5:03pm CT *** Adam McCalvy tweets that Braun underwent an MRI last night. Turns out the injury is to his oblique as opposed to the intercostal. Doesn’t necessarily change much with timeframe but they know how to specifically treat it now. Starting shortstop Jean Segura met with reporters following Sunday’s game to talk about his injury. He did so with a swollen right cheek and a gash on the same currently sealed up with stitches. 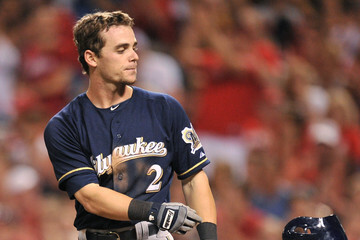 Roenicke told the media on Saturday that his All-Star had avoided a concussion and any fractures. When asked on Sunday about his vision, Segura said that he could see fine but that the swelling would need to go down before he could play. He was then asked if he thought he’d be able to play this week coming up. I spoke to injured Brewers outfielder Logan Schafer after the game on Sunday. He told me that he was set to test out his healing hamstring today (Monday) and then join the Class-A Advanced affiliate Brevard County Manatees for a rehab assignment. The Brewers could use Schafer’s defense as well as his bat to be available again. Elian Herrera has filled in well enough defensively but hasn’t contributed much at the plate (2-for-13, both singles, .154 AVG with no walks) since being recalled 10 days ago. Assuming Braun and Segura avoid the DL as is currently the plan publicly, Schafer’s return will likely come with the demotion of Herrera back to Nashville. That would likely be predicated on at least Segura returning to the field before then, as currently Herrera is the backup shortstop to Jeff Bianchi. Schafer is eligible to return from the 15-day disabled list on Saturday, May 3rd in Cincinnati. Relief pitcher Brandon Kintzler returned from the DL prior to the just completed weekend series with the Cubs at Miller Park. He made one appearance in the set, an inning of work on Sunday. In it, he allowed his first run of the season when Starlin Castro took him deep to left field. It ended Kintzler’s run with fellow setup man Will Smith and closer Francisco Rodriguez as Brewers relievers who had yet to surrender a run. Having not gone on a rehab assignemtn, Kintzler will be eased back into setup work while recapturing any lost sharpness.